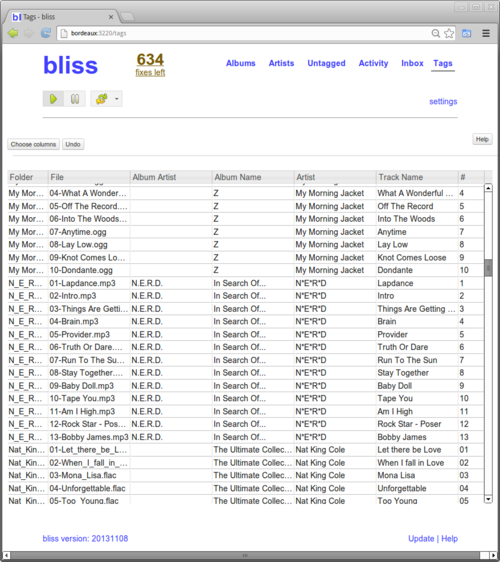 bliss was originally conceived as a fully automatic music library organiser. It used rules to assess and fix elements of your music library in an automatic way, or to take prompts from you, the music library curator, as to the best way to fix non-compliance. Examples of these would be incorrectly sized artwork, track numbers of the incorrect length, genre assignments from unwanted, overly specific genres and so on. When bliss was first released this was a little novel because it was in contrast to the other tool-of-choice for music collectors: the music tagger. Music taggers ("taggers", "tag editors", call 'em what you like!) are much more nuts-and-bolts; they list your files and all of the tags stored within. The rest is up to you, and although many taggers offer batch and automated "actions" they don't really cover the semantic and automation possibilities bliss does. Underneath bliss's concept of rules, it is basically a music tagger. It reads the tags, changes them and saves files, just as you would if you were using a music tagger yourself. That means it was a short step to go from displaying bliss's rules, assessments and results to showing the underlying tags. I say a short step; I mean conceptually. It was a fair bit of implementation work I can say! Tag editors do have advantages: they can access tags that bliss cannot through the scope of bliss's rules. Thus, there comes a time where you need to roll up your sleeves and get down and dirty with music tags. I recently changed the tag editor to a much more responsive UI component, so I thought now was a good time to update you with some of the things you can do with bliss's web based tag editor. Remember to let me know of more ideas via the ideas forum! This gives the traditional "spreadsheet" style view of files and tags. The files are ordered by folder name, then by filename, with the tag values completing the remainder of each row. You can then simply type the new value, and press [enter] or click away. This saves the new value into the file. You may see bliss re-assess the album at this point. Don't worry if you save the value accidentally, you can undo it later. 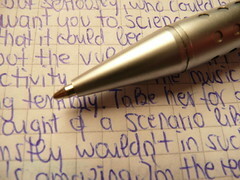 To make multiple edits easy, you can also navigate between cells using the cursor keys on your keyboard. Here I've removed the Album artist column and shown the Genre column. The columns available and shown in the Choose columns section are all the tag fields available in your library. Hope that helps you get web-based tag editing with bliss! Thanks to photosteve101 for the image above.